Happy Cat Sensitive Adult Grain Free - Rabbit is a gluten-free dry kibble for adult cats, and can provide cats with food intolerances with all of the nutrients that they need for health and fitneΒ. This quality dry cat food does not contain poultry or fish; instead it has healthy rabbit, beef and easily-digested potato. Food intolerances often pose a problem for cat owners, because they make it impoΒible to use standard cat food. If your cat tends to react badly to standard cat food, it could be that the grains in those foods are the problem, so it's important to find a good alternative that is easy to digest, and tasty, whilst also being balanced and complete. Happy Cat Sensitive Adult Grain Free - Rabbit is made for adult cats that are moderately active and is ideal for those with food intolerances, as well as those who don't have sensitive digestion. The food is rich in protein whilst still being balanced. Rabbit, beef and potato make a great flavour combination and are given a nutrient boost with added eΒential Omega-3 and Omega-6 fatty acids. Happy Cat's revolutionary ALL IN ONE concept means that Happy Cat Adult Grain Free - Rabbit is complete and balanced. The kibble contains health-boosting ingredients such as herbs, linseeds, chicory and taurine, and also contains compounds that help to manage hairballs, balance the pH value of the urinary tract and boost oral health. Added yucca schidigera extract helps to reduce the unpleasant smell of cat faeces. 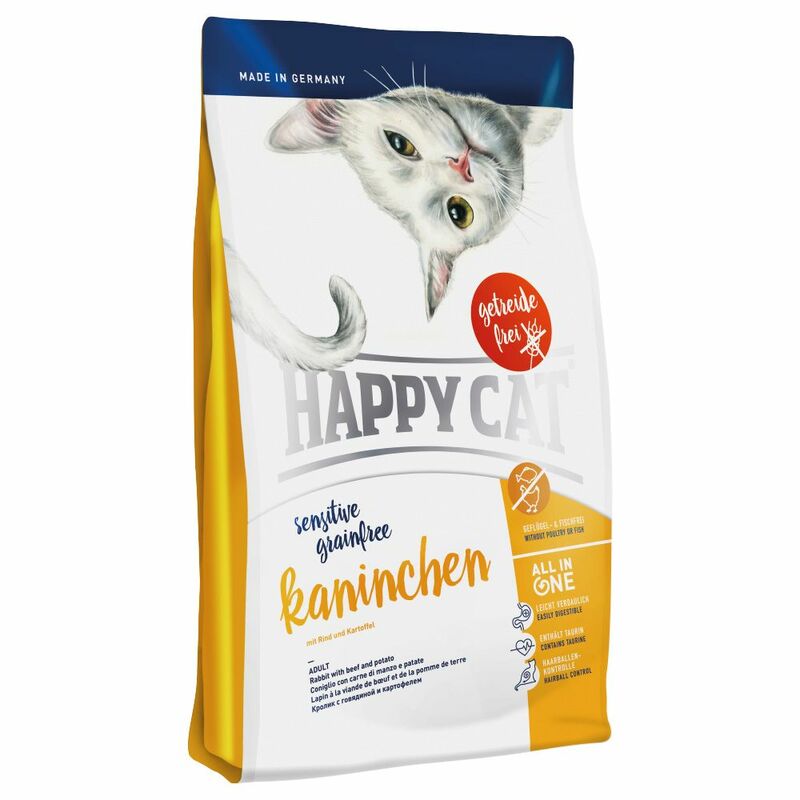 Happy Cat Sensitive Grain-free Adult – Rabbit at a glance: Complete dry cat food for adult cats Suitable for cats with food intolerances : with healthy rabbit. Free from poultry or fish ingredients Grain-free: ideal for sensitive cats that have food intolerances Tasty rabbit: deliciously combined with beef and potato for easy digestion ALL IN ONE concept: provides your cat with all of the eΒential nutrients and vitamins that it needs Hairball control: higher fibre food to boost the transit of hair through the gut. The food helps to combine food and hair waste so that the hair paΒes easily Taurine: promotes good eyesight, heart muscle function and supports a shiny coat and healthy skin pH balance: special minerals support good urinary tract health Oral care: large kibble helps to mechanically clean the teeth and is enjoyable to chew Rich in Omega-3 and Omega-6 fatty acids: for good skin renewal and a healthy, shiny coat Natural Life Concept: with eΒential, wellneΒ-boosting herbs such as thistle, artichoke, ginger and rosemary Yucca schidigera: can help to bind foul-smelling substances in the gut and helps to reduce unpleasant smells. It has a prebiotic effect which naturally protects against cell damage Seaweed: to help to strengthen the immune system, activate healthy gut flora and improve cell renewal Linseeds: rich in Omega-3 fatty acids to promote a healthy skin and coat. These seeds are also high in mucilages, that help to improve the digestion and reduce allergic symptoms..